My family is not what you call morning people. Really, there is few things we get up early for! One thing that can almost always get us up for, is fishing. Through experience, we learned that we always caught the most fish early and late in the day. When we were offered a chance to go fishing on the "Reel Fun" out of Dana Wharf Fishing, we jumped at the chance. While the 6:30 boat is not the only time, we chose to go for the early fish will take the bait mentality. The best part of waking up early? The sunrise! WOW! I loved how beautiful Dana Point looked with the sun rising over the hill. Even the Stand-up Paddle Boarders were enjoying it. I know that not everyone is a fan of fishing but I have yet to see a child who doesn't get excited about catching their first and second and... fish. If you don't have your own fishing rods, don't worry, you can rent them in the office. The staff was super helpful and was right there to cut bait and help remove fish off the lines. After a short stop at the bait barge, we were off to the first fishing spot. How do we find the fishing spot? Look for the birds! These pelicans were sneaky and tried to steal our fish at every turn. One thing that I didn't take into consideration when we booked our trip was WHALES! We are in the height of the Gray Whale migration and we saw no less than 4 Gray Whales and 30 dolphin. Our lines were baited and in the water. It wasn't long before we were pulling in fish! In fact, my 5 year old caught the first fish on the boat and then proceeded to catch another 6! Not to be outdone by his little sister, my son caught up fast. My hubby and I couldn't be outfished by our own kids! We were catching a bunch too! Our boat caught; Calico bass, Olive bass, Sculpin, Sheephead(male and female) and a ton of Mackerel. While we would have loved to catch dinner, we were just happy catching and releasing our fish. What did my family think of fishing on the Reel Fun? 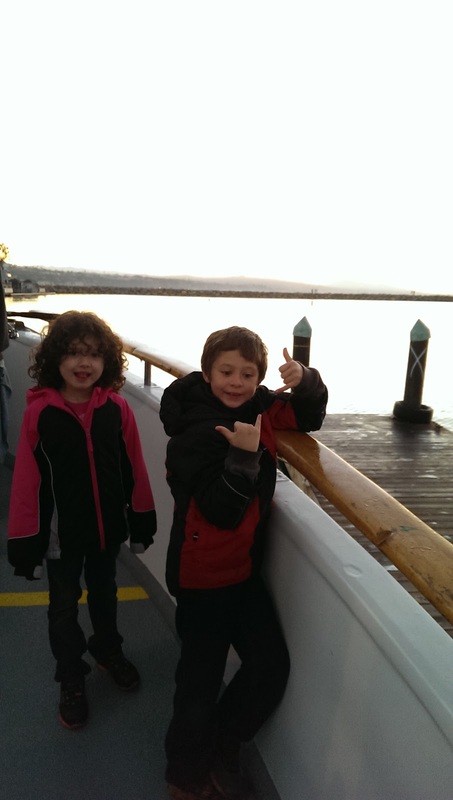 Well, my son who had touch of sea sickness, gave a double "Shaka". His grandpa lives in Hawaii and he thinks this is the best compliment! Better than 2 thumbs up! Did you know that every Sunday, kids fish FREE? Make your reservations here. How would you like to win Whale Watching tickets with Dana Wharf Fishing and Whale Watching? DISCLAIMER: My family was invited on the fishing trip in order to share our experiences. All thoughts and ideas are my own. Do not use any photos without permission. Mine and my kids favorite whale is the Orca! Love Orcas....I blame it on "free Willy"!!! I don't think I have a favorite whale...yet. I like the humpback whales!